Sandy Scott: Where the VIP come to RIP, 20ème arr. Where the VIP come to RIP, 20ème arr. 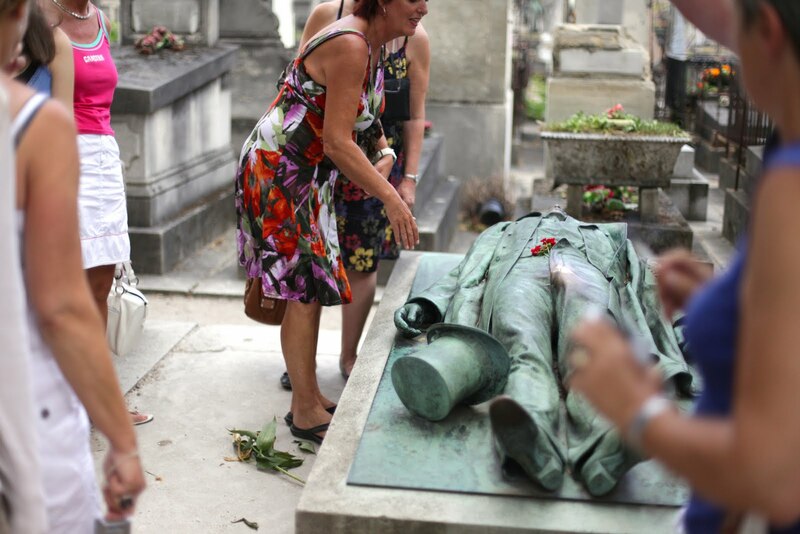 This is Paris’s ultra exclusive cemetery, le Cimetière du Père Lachaise: resting place of the late rich and famous. A friend of mine and I popped by this weekend and we ran into the nicest tour guide, whose tour group hadn’t turned up and who offered to show us around. He took us under his wing and on a two hour guided wonder through the cemetery. The place and its history are amazing! The most popular graves are covered in little offerings left by visitors: thank you notes and abusive notes from philosophy students for Marcel Proust (depending on how their exams went), potatoes for Antoine Parmentier, alcohol and cigarette butts for Jim Morrison… or even Lego pieces for Mr Henri Lego, who has nothing to do with the toys but gets a gift anyway. Tu es photographe? Tu fais de très belle photo, et on a le même gout pour la bonne nourriture en prime !